Indie184 is from New York and was born in 1980. 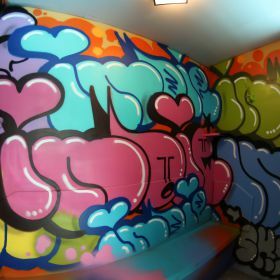 After more than a decade as a graffiti artist she decided to extend her artistic expression globally. She left business school to teach herself to sow, paint and do graphic design. Her work is influenced by abstract and pop art; it takes the form of an explosion of colour, texture and personal messages which all combine with her principal mode of expression: graffiti. Indie184's art has been shown in galleries and museums throughout the world including the el museo del barrio in New York and the Völklinger Hütte museum in Saarbrücken Germany. You can also see her graffiti in the streets of New York and Paris. Indie184 has recently worked with M•a•c cosmetics, Marvel and Netflix.